A circus act gone horribly, horribly wrong. It was clearly not this man’s lucky day! Or was it? 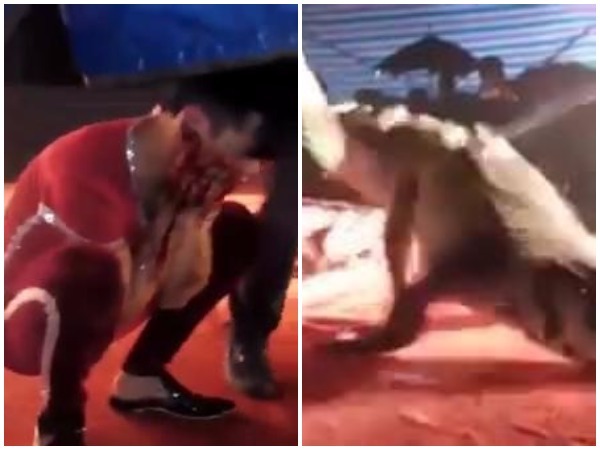 A circus performer stuck his head inside a crocodile’s head for an act but the massive reptile unexpectedly shut his mouth and tore the man’s face off. The man was entertaining crowds at a circus in the Ha Nam province of Vietnam. In the video, you can see the man bending next to the crocodile and stroking the animal while moving his head closer and closer to the reptile’s mouth. Suddenly you can hear a bloodcurling scream as the crocodile shuts his mouth and tosses the man back and forth three or four times before letting him go. While many in the audience were screaming in horror the man covered his face as the blood ran from it. Shortly after the man is given a towel and led away. According to MailOnline the crocodile who was supposed to be part of the act died shortly before the performance, and they needed to find a replacement crocodile. Ha Nam’s department of culture, sport and tourism invited the known circus troupe to perform at the Liem Can commune in the district of Thanh Liem, says Pham Van Do, the areas administrative chairperson. “Fortunately, the actor was only wounded in the incident. Now he is being treated in hospital in Henan province. By this morning, the health situation of the actor was better,” says Pham. “An investigation has been handed over to the police chiefs,” he adds.